Charge Shot!!! : The Myspace Layoffs: Have We Seen This Before? Will We See It Again? Have We Seen This Before? Will We See It Again? 2010 was the year that pretty much cemented Facebook's ascension as the dominant player in the social networking world. It managed to fight off the rising tide of Twitter, earn an estimated worth of $50 billion, and be the subject of a fairly well-acclaimed movie that cements the website's status as some sort of generational milestone. In The Social Network, David Fincher uses Facebook and Mark Zuckerberg as a way to examine how we communicate in the 21st-century and, in the process, portrays Facebook not as an Internet flash-in-the-pan, but as a full-blown paradigm shift. News came out this week that Myspace (remember them?) is cutting half of its remaining staff. The Other Social Network has declined in inverse proportion to Facebook's meteoric rise, and these layoffs, combined with the recent Myspace make-over that allows the user to integrate the site with Facebook, pretty much confirm that the Social Networking wars are over. A quick search on Google Trends reveals April 2008 as the date in which Facebook surpassed Myspace (at least as a search term). 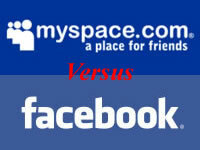 At that time, Facebook did not even have 100 million users; presently, it has more than 500 million. As of this summer, Myspace had a mere 66 million users. So flows the tide of the Internet. Once upon a time, Myspace was the epitome of a cool plugged-in culture. Now, it seems a hopelessly dated relic of the digital landscape, something that I can see Mo Rocca and Michael Ian Black cynically deriding on some future version of I Love the Aughts. The past fifteen years or so has acquainted us with many of these Internet boom-bust cycles, and it looks as if Myspace is only the next casualty in a long line of them. Other stalwarts of the early aughts are also on the decline - eBay has been hemorraghing traffic for years, as the auction site slowly developed into a glorified secondhand store. Vendors have found better venues to hawk their wares - most notably on Amazon and Craigslist. Yahoo! has also gone through several rounds of layoffs and rumors about impending sales, and its estimated value has been declining rapidly. It has been shedding the aspects of their once great empire that no longer net them any money - Geocities and del.ic.ious are among the casualties. With the value of Facebook figured at $50 billion by Goldman Sachs, it's worth wondering if the social network is going to eventually go through this cycle as well. Myspace, Yahoo! and eBay were also hailed as digital giants once upon a time, but their stock has declined considerably and nearly everyone agrees that they're past their "sell-by" date. Facebook grows in popularity and notoriety, but perhaps this is nothing but a trend, and in five years we'll be laughing about how it was once valued so highly and how seriously everyone took that movie. Facebook itself has done a fairly decent job at transforming the site to meet the rapidly changing interests of the Internet. Recall the introduction of the "redesign" after the rise of Twitter, as Facebook struggled to keep itself relevant. Notice also that, after the public outcry surrounding a few developments on the website, Facebook has been extra careful to slowly introduce new changes. The current gradual transition to the "New Profile" is just one way that the website is trying to make these developments less rocky, updating their image while not rocking the boat too much. This dichotomy of tradition and innovation is something that all brands have to deal with, but the fast-paced nature of the digital world makes the narrative flow by that much faster. Myspace went from hot to irrelevant in the blink of an eye, just as Yahoo! 's attempt to fit the entire Internet onto their homepage clashed with Google's pristine minimalism. The Internet has changed quite a bit since Facebook's 2004 birth, but so far the site has shown quite a bit of savvy in adapting these new trends while not isolating its core base of users. Facebook has managed to walk this fine line so far with great success, unlike many websites that rose to prominence around the same time. Recently, the social news site Digg managed to trigger a mass exodus with new changes to its services (note the drop in pageviews here). In attempting to reinvent itself, the site managed to abandon many of its core adherents. It's a lesson that any website must take to heart. How permanent is Facebook's presence in our digital lives? As dominant as its rule might seem, these things are always precarious, and many seemingly secure websites are merely propped up by a never-ending line of venture capitalists (it's worth noting that Facebook itself did not report a positive cash flow until September 2009). Is there a chance it might become another passing fad, something to be looked back with half-shameful nostalgia in another decade? It depends how tight it can establish its grip while Facebook is still at the top of its game. I've heard many friends (hell, even myself) express a desire to leave the website. But it holds so much - contact information, old college photos, connections to old friends - that leaving is harder than it sounds. For example, email is in decline, especially among younger users. I teach college students, mostly freshman, who are more comfortable sending texts and Facebook messages than emails, even in formal academic situations - one coworker of mine has received Facebook messages from students hoping to add a class. If this trend continues, Facebook might make itself a permanent presence merely by becoming the new email - much like cell phones have rendered little black books irrelevant, Facebook might mean that I never have to learn anyone's email address ever again. Rumors of upcoming Facebook email make this all the more pertinent. Of course, with great power comes great responsibility. One can easily see the danger of the entire world relying on a single website for the entirety of their digital communications. At some point there comes the event horizon, the tipping point in which we have so much information stored on Facebook that there's no turning back. I've already reached this point with Gmail; it's not unlikely that Facebook can persevere through the mere fact that the next generation will consider it the primary mode of communication on the Internet. It remains to be seen if Facebook will join Amazon and Google in the elite club of websites that remain relevant for longer than five years. I'd say the odds are likely. But I'm sure people once thought of Myspace in the same way.